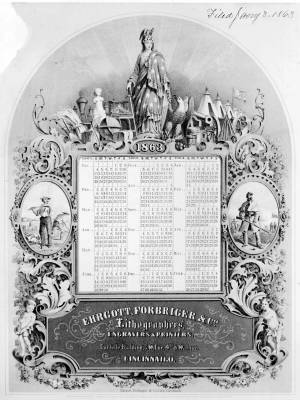 An advertising calendar for a lithographic printing firm, decorated with Unionist symbols and motifs. The calendar for 1863 and the first 6 months of 1864 is surrounded with an elaborate framework of floral and acanthus ornament, surmounted by the figure of Columbia or Liberty. The figure is closely based on Thomas Crawford's statue of Freedom on the U.S. Capitol. She stands holding shield and sword, and wearing a robe emblazoned with stars and an eagle headdress with a crown of stars. At her right are symbols of progress, industry, and culture: a locomotive, a plough with a sheaf of grain, a statue, and a printing press. At her left are artifacts of war such as tents, cannons, arms, and an eagle. Flanking the calendar itself are two vignettes. On the left is a peacetime scene, with a farmer holding a scythe as two field hands harvest grain behind him. On the right a soldier with a rifle stands before a battlefield. Two putti appear in the acanthus scrolls below.